Justina asks: Why don’t figure skaters get dizzy after they spin? To understand why, it’s important to know why people get dizzy in the first place. Dizziness is controlled by the vestibular system in your upper inner ear. Within the vestibular system, there are three canals that contain fluid called endolymph, as well as sensory nerve cells that look sort of like little hairs. When you move your head, the endolymph resists change in motion and lags behind, stimulating the nerve cells. Those cells send messages to the brain, telling it which way the head moved. Now, when you spin, the endolymph lags behind at first, but then moves at the same rate that you’re spinning around. When you stop, the endolymph resists change in motion again, and keeps going for a while. This sends a message to your brain that your head is still spinning even if it isn’t, resulting in the dizzy feeling. The endolymph slows down eventually, making you feel normal again. Dancers and figure skaters have captivated audiences by spinning around and around on a fixed point. Afterwards, they’ll often leap straight into another move. Part of the reason this is so interesting to the people watching is that many people can’t understand how they could possibly remain standing without so much as a wobble after spinning around so much, let alone leaping into another move. Don’t they get dizzy? So, the same principle should apply to figure skaters too, right? With the help of the ice, figure skaters are able to spin at much greater speeds than dancers can, which means this method isn’t really safe to practice in these high speed rotations. They will stare at a fixed point at the end of each spin move, but they typically don’t whip their heads around continually during it, as this could cause injury to their necks at the rotational speeds they achieve. Because of this, they aren’t easily able to trick their brain as well into thinking the head isn’t moving at all. So how do they do it after these high speed spins? The answer is the somewhat anti-climactic, but perhaps more impressive, “they just get used to it.” Figure skaters do typically get a little dizzy, but a lot of training means they are usually able to ignore the sensation and carry on as normal, without the audience ever noticing. Oh, you definitely get dizzy, but your body learns to build a tolerance for it. It’s like when you go upside down on a really fast roller coaster, you’re going too quickly to realize you’re upside down. So I guess, when you’re going so fast that everything’s a blur, you don’t get as dizzy as if you are spinning more slowly and see specific objects going by, if that makes any sense. There are tricks other than “spotting” that coaches will teach their pupils as well. Breathing exercises between rotations in the early stages of training help the figure skaters regain control after spinning. In addition, at the end of a long spin, some figure skaters will incorporate a dance move into their routine before a jump, which requires more balance. The dance move not only masks their temporary dizziness, but also provides a short reprieve, allowing their endolymph to settle back down. So, when you’re watching the winter Olympics, watch out for those figure skaters’ dance moves after a big spin—they’re probably dizzier than you think! If you are dizzy from spinning around, try spinning the opposite direction for the same number of turns that got you dizzy in the first place. By going in the opposite direction, you’ll move the endolymph fluid back, and you’ll probably be a lot less dizzy afterward. Astronauts often get dizzy because of being in a continual free-fall state. NASA studied 1956 Olympic silver medal winner Ronnie Robertson in an attempt to figure out how they could help astronauts deal with weightlessness, but they found that Robertson never got dizzy, even when spinning 500 revolutions per minute. That certainly gave him a leg-up on his competitors! If you guessed he was known for his spinning, you’d be right. You can see examples of this here. 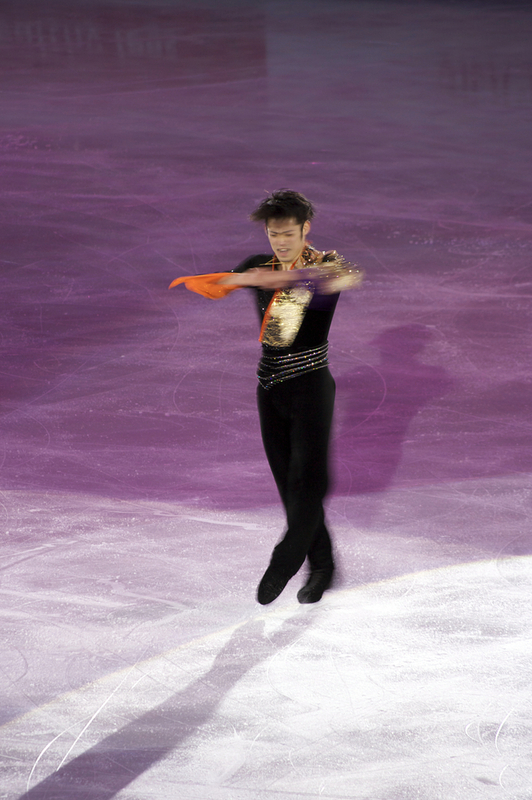 Olympic skaters can typically spin so fast it looks like they’re a blur. How do they do it? By starting with their arms and leg (and sometimes head) out, and then tucking their appendages in while aligning their head with their body. This works thanks to the law of conservation of angular momentum, with the skaters picking up speed by reducing their rotational inertia as they bring the mass in closer to their body. This could be a separate article on its own, which we may do at some point, but for those curious for more detail on the physics of this, for now just head here. In 2003, Lucinda Ruh, a former Swiss national figure skating champion, set the world record for the most spins conducted on one foot. She spun 115 times. Jackson Haines, an American ballet dancer and ice skater, was the first to incorporate ballet and music into skating. However, the idea didn’t become popular in the United States until after his death in 1879. The first U.S. figure skating competition in Haines’ style was in 1914, despite it being incorporated into the Olympics in 1908. Traditionally, men competed in figure skating competitions. However, in 1902 a woman named Madge Syers entered to compete in the World Figure Skating Championships. Women were then banned from competing against men in figure skating competitions, with a separate women’s division being established in 1906. Why Don’t Ice Skaters Get Dizzy?